The Pole Barn Guru discusses the always popular ceiling insulation, vapor barriers with insulation, and closed cell spray foam insulation. DEAR BRAD: If you have a condensation control barrier (having a thermal break, not just a vapor barrier) of some kind between roof steel and framing, then there would be no need to closed cell spray foam underside of roof deck, unless you are going to use this as your only insulation. Insulating ceiling line creates a dead attic space above, so it will need to be ventilated (either eave and ridge or gable vents). 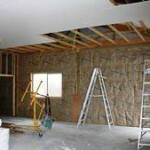 Closed cell spray foam will give you a very air tight building, applied properly. DEAR JIM: You are going to have insulation sandwiched between two vapor barriers, however air leakage into the cavity is a greater issue than through a vapor barrier. Goal is to keep insulation and wall framing dry. As long as you adequately seal all of the air leakage pathways you would not need an interior vapor barrier. In other words – if you install an electrical outlet or switch box, seal it, seal around any door or window openings. DEAR JIM: My recommendation would be two inches of closed cell spray foam on inside of steel siding. Install another set of girts on inside of columns to support interior wall finish material. Fill wall cavity with BIBs (https://www.hansenpolebuildings.com/2011/11/bibs/). Glue two inches of closed cell foam insulation board on inside of girts, sealing around any penetrations. Glue interior finish material to inside of insulation board. This entry was posted in Insulation, Ventilation and tagged insulation, vapor barrier, ceiling insulation, close cell spray foam on March 11, 2019 by admin. Regular readers of this column recognize a groundswell movement towards energy efficient post frame building design. Reader (and Mechanical Engineer) DAVID in CONNECTICUT had some thoughts (after reading a volume of my article pages) in regards to FPSF (Frost Protected Shallow Foundations) and radiant in floor heat. Firstly, I have read thru many (if not all) of your blog posts about foundations/slabs, browsed more than 40 pages of 80 blog list pages, as well as plenty of external references. Thanks for all the info you’ve put up! So trust me I’m not just trolling and looking for inconsistencies, just trying to get the best understanding possible before building and hoping to condense some of the knowledge that is spread through your blogs. I‘m a mechanical engineer by trade but my thoughts stray into many other areas! Because of your focus on engineering, Hansen is a front runner for getting my money. Also, I thought maybe I could contribute to the evolution of your build process to make things easier for the insulated slab folks here in frost country! I am in CT, frost and cold are an issue for heating my near-future garage. I’d like to run PEX in slab, and r10 foam under slab was recommended for max efficiency. How to install PEX Tubing in a concrete slab I’ll also likely be doing at least a partial FPSF at the edges. 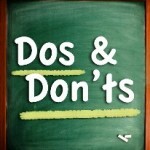 In your blogs there seems to be a little bit of conflict on what you recommend for site prep. Here, in the “thoughts” section at the bottom, https://www.hansenpolebuildings.com/2011/11/soil-compaction-how-to/ you recommend the gravel go in after the posts, but that seems to require plenty of back excavation to get the recommended gravel depth. How is the builder supposed to remove 6+ inches of ground from underneath and not disturb the soil under the skirt board? Plus, in the case of the people to do have gravel put in, you just spent all that effort putting it in and compacting it now you have to dig it out? What I read at the “concrete slab -3” link above seems to indicate that I do organic removal, use at least 6”of properly compacted crushed processed stone to bring it back to (or just above) the previous grade, build the structure with skirt/splash board on that grade. Then for a 4” slab, re-excavate down 2 more inches for the insulation/ vapor barrier. That might be fine, but you also mention “prior to pouring (concrete),” use 2-6 inches of sand/ sandy gravel below the vapor barrier and 3-4 inches of sand above it. That would be a minimum of 5 additional inches (+2 for foam= 7”) of internal excavation after building! Or did you mean the first layer of sandy gravel would go on-grade and be built on? That’s still 5 total inches of post-build excavation (3 more of sand + 2″ of insulation board). Something still doesn’t quite add up. Not to mention the effort/ difficulty of re-leveling and re-tamping the internal excavated surface again! You specifically mention in several places never to exceed 3.5” up the 2×8 skirt board, which is also fine, but what if we look into deeper slabs and less work to excavate? What if we did all the gravel/sand down 2” from FINAL grade, and used a 2×10 ground contact skirt board? Then there would be no interior excavating. I designate “final” grade because the area would be leveled, then building built and 2” backfilled against the skirt. OR in the case of a FPSF, the vertical insulation would be there anyhow. If there must be 2” of sandy mix above and below the vapor barrier you could use a 2 x12 skirt, right? 4. Also this article recommends against sand pre-pour. 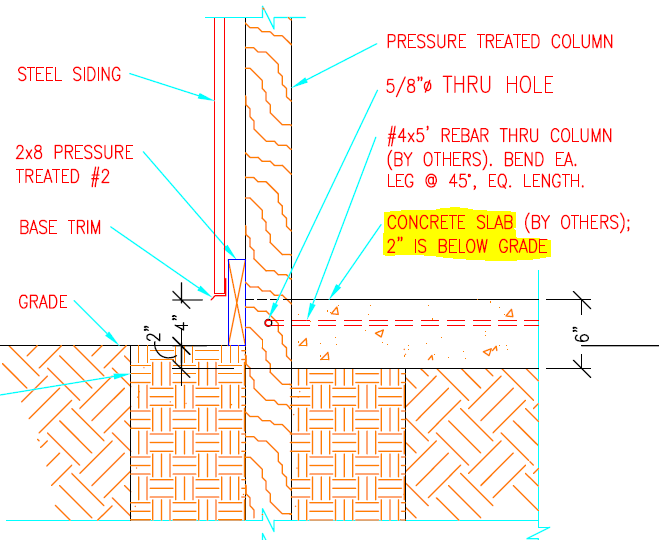 https://www.concreteconstruction.net/how-to/site-prep/subgrades-and-subbases-for-slabs_o Thoughts on that? 5. Lastly, I had an idea to more easily prep the area for both insulated slabs and FPSF. This also prevents disturbance of the sub-grade area during the install of the FPSF external insulation. Please see the illustration below. 6. Prep the area with appropriate sub-base compacted gravel but at a lower than “finished grade” level. This would be an area consisting of the building size plus 3 to 5 feet in each direction. 7. Install the poles and footers. 8. Install the 2 x12 skirt board on surface of the lower than final grade area. Backfill in lifts, compact, and re-grade the area outside the skirt board insulation. This supports the subgrade area UNDER the skirt board and behind the insulation so you don’t accidentally leave voids behind it. THEN you add and compact the material inside the skirt board like sand/ stone-dust, vapor barrier, insulation foam, rebar and PEX tubing. This prevents weakening of the material under the skirtboard as well, because it’s never disturbed! Last you pour 4” of concrete leaving a 3.5” reveal and you have the same post length, siding material and eave height/ clear height as before. Can you even get 2 x 12s treated that might work in this application? Is UC-4B needed as it’s not exactly structural, right? Plus it’s surrounded by foam and well drained soil. I know this is long, I apologize again, but I appreciate your careful review and answer in advance! Thanks, and I can’t wait to hear your thoughts! Feel free to edit/ take snippets out for another FPSF blog post if it’s helpful. The post to end all FPSF/ slab prep/ frost blog posts! Honestly, 80 pages of blog post lists is very cumbersome. I’m thinking a digest of some kind is in order! Tune in to our next episode for a thrilling (and simple) conclusion! 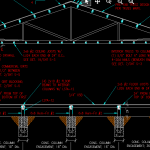 This entry was posted in Insulation, Pole Barn Questions, Pole Barn Design, Pole Barn Planning, Pole Barn Structure, Concrete, Footings and tagged insulation, vapor barrier, radiant heat, FPSF, pex tubing, skirtboard on February 13, 2019 by admin. Today the Pole barn Guru discusses crawlspace skirting, adding spray foam, and building with rafters instead of trusses. DEAR TRENT: In areas where your building’s crawl space would involve excavation below grade, it might behoove you to place a permanent wood foundation between columns (https://www.awc.org/codes-standards/publications/pwf-2015). In other areas most of our clients have run steel siding down to four inches above grade, just like typical post frame construction. DEAR POLE BARN GURU: Looking to spray foam the Hansen pole barn we built. DEAR MARK: Make sure to use only closed cell spray foam. I have heard arguments both for and against using spray foam against either a weather resistant barrier (such as Tyvek) in walls or a reflective radiant barrier. For this one I would defer to an answer from whomever will be doing your foam application, since they will have to warranty their installation. Certainly you can spray foam directly to inside of steel panels – I did this in a recent addition to my own post frame building home. You will need to close off both vented ridge as well as soffit. This entry was posted in Insulation, Pole Barn Design, Pole Barn Planning, Pole Barn Structure, Ventilation and tagged insulation, spray foam, Rafters, crawl spaces, skirting, pole and raftered on February 4, 2019 by admin. Lots of things happening here, so let’s dive right in. Ditch your current heaters and replace them with vented units. There are efficient vented gas heaters available, providing same type of heat you are used to, but they exhaust all their combustion by-products outside through a wall vent. You’ll lose not only water vapor, but also carbon monoxide, nitrogen dioxide and other contaminants. Use a high quality sealant over your building’s concrete floors: https://www.hansenpolebuildings.com/2018/11/siloxa-tek-8505-concrete-sealant/. So far we have eliminated sources of most condensation, moving next to how to best insulate what you have. Chances are very small your building’s trusses will support a ceiling. This would have been an ideal case, as it would have kept you from having to pay to heat an area above truss bottom chord level. Replace your present overhead and sliding doors with insulated overhead doors. Tear out foil “insulation” and throw it away. Keeping eave and ridge vents sealed, use closed cell spray foam insulation across walls and underside of roof deck. An absolute minimum thickness will be two inches, providing approximately R-14. You will need to weigh benefits of greater R values against investment. Me – if allowed by my Planning Department I would build another building properly designed to be energy efficient. Chances are it will be comparable in investment to what you are going to throw into a three decades old building, plus it will be brand new! This entry was posted in Insulation, Pole Barn Questions, Pole Barn Structure, Ventilation and tagged insulation, condensation, soffit vents, gas infrared heater, vented gas heaters, floor sealant on January 23, 2019 by admin. In todays blog, the Pole Barn Guru discusses stilt homes, ductwork in attic, and post frame house design options. DEAR MARK: Thank you for your kind words, as well as you doing research to provide an affirmation. 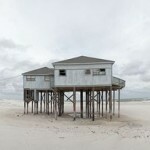 For those who missed it, read more about stilt houses here: http://www.hansenpolebuildings.com/2017/09/stilt-houses/. DEAR ROB: A downside of most HVAC duct work – little or no thought becomes involved in how to effectively insulate it. Wrapping ducts with a thin layer of fiberglass or radiant reflective barrier happens to be more for show than being effective. Unless your plan has roof plane insulation, I would place ductwork as close to ceiling level as practical and bury them within blown in insulation (I’d even pay a little extra for insulation to be thicker over ducting). In cases where ceilings will be applied, we automatically increase ceiling dead load to 10 psf (pounds per square foot), covering weight of those added materials. DEAR MELISSA: Thank you for your interest in a new Hansen Pole Building. 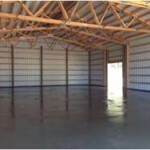 We have provided numerous post frame buildings in every U.S. state – including Mississippi. We also respect deeply our clients’ rights to privacy. As such, we do not disclose names or contact information of our clients, nor physical addresses of where our buildings are located. Our website includes a plethora of building photos and within sound engineering practice we can provide virtually any post frame design. As our buildings are totally customizable. Your only limitations will be imagination, budget and available space. Please feel free to contact one of our Building Designers any time (866)200-9657 for free consultations. This entry was posted in Insulation, Pole Barn Design, Trusses, Ventilation, Footings, Columns, Post Frame Home and tagged insulation, stilt construction, Ductwork, house design on November 26, 2018 by admin. 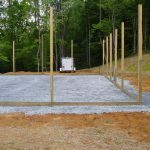 The Pole Barn Guru helps with installing insulation in wet seasons, properly treated posts, as well as a solution to embedded posts when bedrock is present. DEAR POLE BARN GURU: Hello. I am ready to install the insulation and metal on our pole building’s roof. I remember reading how it is important to install the insulation and roof when things are dry as to keep the insulation dry. We have recently moved into a rather wet early fall, and dry weekend days have seemed very illusive. DEAR BRAD: You want to avoid trapping water between Radiant Reflective Barrier and roof steel, as it can lead to premature deterioration of roof steel. A helpful hint – in rainy weather only place one run of barrier and if upward surface gets wet, towel dry it and immediately install steel roofing to cover. Just one reason I now recommend using roof steel with an Integral Condensation Control: http://www.hansenpolebuildings.com/2017/03/integral-condensation-control/. CARL: I personally would not want to use them as level of pressure preservative treating (as well as chemicals used) could very well be iffy at best, toxic at worst. 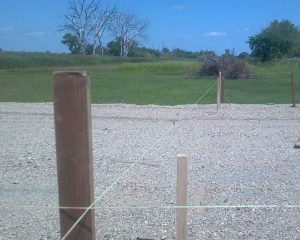 Read more about utility poles in post frame construction here: http://www.hansenpolebuildings.com/2012/11/used-utility-poles/. DEAR POLE BARN GURU: 26’ x 42’ pole barn planned. We hit rock 6” down. Builder now wants to consider option of to pour the 4” slab first and use post saddles to anchor the posts on top of the slab. He says “This is a good option and results in longer life of the treated posts. Included in this option is additional bracing on each post” Is this really a viable option??? DEAR VICTORIA: Unless your builder can provide engineer sealed plans for your building including his “solution” fire him now because he has no clue. Why do I say this? A four inch thick concrete slab only will provide inadequate to mount a building to. While a properly pressure preservative treated column will last longer than any of us will be alive to witness, of course if it does not touch ground it eliminates potential of any decay due to ground issues. This entry was posted in Insulation, Roofing Materials, Concrete, Footings and tagged posts, insulation, A1V, bedrock, slab, post treatment, roof steel wet on November 12, 2018 by admin. The Pole Barn Guru addresses questions about frost heave, a sliding door dilemma, and plans on climate control. DEAR POLE BARN GURU: Hello. Do you have any information regarding how to avoid frost movement with Pole Barn Building designs in stony ground and cold climates such as Norway? There is a building nearby that had moved in the thaw so would like to know if Pole Design is suitable or not. I could send a photo if needed. (Maybe North US/Canada references will be ok as could be closest ground and climate to Norway. Post Frame (pole) buildings do very well in cold climates and frost heave can be avoided, given good preparation. 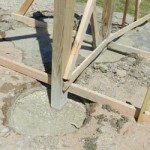 Here’s a link to a series of three frost heave articles to get your building project properly directed: http://www.hansenpolebuildings.com/2011/10/pole-building-structure-what-causes-frost-heaves/. DEAR ALAN: I am surprised this dilemma was missed by both whoever sold you your building and a RDP (Registered Design Professional – architect or engineer) who sealed your building’s plans. However, odd and interesting things do happen. Laws of Physics prevent two objects from occupying same space and time. In order to have door sizes you have listed, sliding in directions desired, one of them would need to be placed inside of wall. This may be less than an ideal answer (not to mention adding to cost). If sliding doors are your only design solution – it would be easiest to just make them each same height. Double sliding door tracks can then be used, with each door sliding upon its own track. DEAR LONNIE: A consideration would be to design entire building to be able to be climate controlled, as you may decide to expand your office space, or building may be re-purposed in future and require some or all of remainder to be conditioned. If you decide to only do your office space, then you can reduce these recommendations to area in question. http://www.hansenpolebuildings.com/2018/06/pole-barn-insulation-part-ii/. This entry was posted in Insulation, Pole Barn Design, Footings, Professional Engineer, Pole Barn Heating and tagged insulation, frost heave, sliding doors, climate control on November 5, 2018 by admin. Moisture from condensation can be a major issue in initially poorly thought out pole barns. “Hi. I am having issues with moisture in my pole barn. It is getting to the point that mold is starting to show up on the walls and cement floor. The barn is about 28 x 36 with 12 foot walls. It has a service door and two 10 foot over head doors and 4 windows on the south wall. The ceiling is tinned, insulated and has a vapor barrier. The floor is cemented and I am unsure if the floor has a vapor barrier. The walls are not insulated or tinned. I’d start with trying to eliminate moisture source. If you leave a wrench lying upon your building’s concrete floor for a few days and return and a dark spot appears below where the wrench was placed, your building has no under slab vapor barrier. If this occurs, use a good concrete sealant across floor. This in itself might resolve problems – watch the steel wall siding insides and see if they stay dry after sealing. If this does not resolve problems, then you need ventilation. I will surmise your building does not have enclosed vented soffits and a vented ridge. Can’t go back and correct lack of overhang issues now, but you can add gable vents – a minimum of 242 square inches net free ventilation area in each endwall with vents located in top half of each gable. Location of your building should also be examined. If soil around building exhibits signs of being moist, you need to make sure grade will allow water to drain away from building. It may be necessary to trench around building and add a drainage system to move water away from your building. Gutters should drain water sufficiently distant from building as well. If nothing else works, here’s how to determine power ventilation requirements: https://www.hansenpolebuildings.com/2018/07/my-pole-barn-needs-ventilation/. This entry was posted in Pole Barn Questions, Pole Barn Planning, Ventilation, Concrete and tagged insulation, vapor barrier, condensation, mold, moisture issues on October 24, 2018 by admin. Detached cold storage buildings are constructed with a sole purpose of producing or storing goods in low temperatures. Think of them as typical heated buildings turned inside out. Instead of keeping heat in during cold weather, they keep heat out during warm weather. 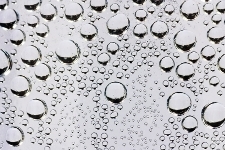 Condensation problems can be huge, if not properly dealt with. Adequate and totally sealed insulation plays a huge part in preventing condensation. Exterior walls should have a Weather Resistant Barrier between framing and wall steel to allow moisture to pass out of wall. Dead attic spaces should be well ventilated with eave air intakes and ridge exhaust vents. Among most critical consideration for cold storage will be selection of a method for insulating the facility. Effective insulation will minimize cold transfer to exterior and reduce operating costs. Recommended cold storage building envelope (shell) insulation values are R-30 in walls and R-40 for roof. Concrete slab should be insulated to R-20. 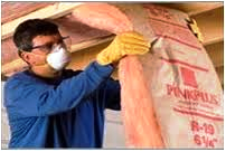 Recommended method of insulation will be polyisocyanurate (Polyiso). Polyiso has an R value of approximately six to 6.5 per inch of insulation, so a minimum of five inches of Polyiso recommended for walls and 6 ½ to 7” in ceiling. It should be glued on, as through fasteners will transmit heat and condensation could form upon exposed heads. It is essential for joints to be sealed and a vapor barrier should be placed between insulation (insulation goes inside of framing) and wall girts and ceiling joists. Failure to totally seal interior vapor barrier can result in Polyiso insulation gaining as much as 15 times its own weight from absorbed moisture. Special consideration needs to be given to site preparation, in order to minimize possibility of frost heave. Building access should be through a wide 14 foot tall insulated overhead door in each endwall. Industry standard storage bins are four feet square and three feet tall. Bins can be stacked five high, leaving room for mechanical equipment above with a 20 foot interior clear height. Allowing space for equipment movement and free airflow around each stack of pallet bins approximately 215 pounds of product can be effectively stored for every interior square foot of building. And there you have it…a cold pole barn! This entry was posted in Insulation, Pole Barn Questions, Pole Barn Design, Pole Barn Planning, Ventilation and tagged insulation, vapor barrier, condensation, polyiso, polisocyanurate, cold storage pole barn, post frame cold storage on September 20, 2018 by admin. 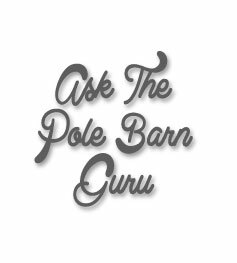 This week the Pole Barn Guru answers questions about uplift concerns, retro-fitting insulation, and setting posts in high water tables. DEAR SCOTT: Regardless of whether your addition will be open, enclosed, or somewhere in between uplift should always be a consideration. Ideally the original EOR (Engineer of Record) who designed your 40′ x 80′ building would be consulted, not only because of a potential uplift issue, but also due to what affect open carport will have upon existing building. You may be placing wind shear issues upon endwall closest to addition and these will need to be addressed, as well as if endwall column footings will be adequate to support added weight (not just dead load, but also potential weight of a snowfall). An issue of drifting needs to be reviewed also, as snow could build up upon carport roof against existing endwall. If original EOR proves unavailable (or nonexistent), you should enlist services of a competent RDP (Registered Engineer or Architect) qualified to review your existing building, as well as your intended work. DEAR POLE BARN GURU: Need your suggestions on any improvements I can make. Below is a sketch of my current building roof insulation. Basically I tried to seal off the cathedral ceiling using the bottom of the purlins to hang 4” Dow board sealed with aluminum tape. I did purchase the radiant reflective barrier that was installed per instructions between the roof purlins and the steel roof panels. I live in Michigan. DEAR JOHN: Always glad to hear back from happy building owners! As long as the cavity was dry when it was sealed up, and the Dow board is sufficiently well sealed there is a chance you will not have problems. The only guaranteed solutions involve having to take down the insulation board and make provision for airflow from eave intake to ridge exhaust by drilling holes through all of the purlins. DEAR PATRICK: Back when I was a contractor we would run into this situation occasionally. Our solution then was to stand columns in holes, brace them and then backfill with pre-mix concrete with very little water in it. Concrete weight would displace water in hole. It did take a significant amount of concrete, however it was only about $30 a yard then. How I would do it now – I would use sonotubes equal to or larger in diameter than what was specified by engineer. Cut tubes to depth of hole length, then cover one end of tube with six ml black visqueen (read about visqueen history here: https://www.hansenpolebuildings.com/2013/07/moisture-barrier/ ) sealed tightly around sides of tube. Place tube in hole with covered end down (this will take some work, as tube will want to float like a boat). Once sonotube has been placed, backfill around outside with compactable material – compacting no more than every six inches. Then stand column in tube, brace it and backfill with pre-mix concrete as engineer specified. This entry was posted in Insulation, Pole Barn Structure, Ventilation, Footings and tagged insulation, ceiling insulation, Uplift, high water table. setting posts on September 17, 2018 by admin. The Pole Barn Guru answers questions bout heating a pole barn, sliding door parts, and a replacement panel for a Hansen Building. DEAR POLE BARN GURU: Many years ago I had a friend that made a good income renting heated storage space in a very large pole barn to boat owners. He complained of the heating costs involved. I told him he could heat the space for a fraction if he would insulate with hay bales encapsulated with foam. He also thought the idea was a little odd (do you notice a pattern with how people receive my ideas? 😉 I don’t know if anyone has ever done it, but I may give it a try before my time is up. DEAR STEVE: On your boat storage – straw bales don’t offer near the R value which most people are accepting as valid (https://www.buildinggreen.com/news-analysis/r-value-straw-bales-lower-previously-reported), plus closed cell spray foam is not an expensive (although very sound from an insulation standpoint) proposition. As most building heat loss is vertical (approaching 80%) the real solution lies there – reduce upward heat loss and heating unoccupied space. 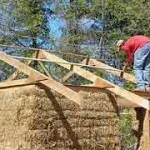 For further reading on straw bales and post frame construction: https://www.hansenpolebuildings.com/2013/04/straw-bale-homes/. Pole Barn Builders on Facebook said you would be a good place to contact. Had a barn fire last year. Now replaced to the point of needing the front double sliding doors and a couple panels hung to finish. Is this something in your wheelhouse? Twin Cities area. DEAR DALE: We always appreciate it when our fellow industry members send folks our direction. Sadly, we are probably not the solution to your current challenge. Due to the logistics of shipping sliding door components without them being damaged, we do not provide them other than with the investment into a complete post frame building kit package. We’d recommend you stop by the ProDesk at your nearby The Home Depot® as they should be able to provide the components you will need plus you won’t have to pay for delivery with a pickup at the store. DEAR POLE BARN GURU: Good Morning. I have a pole building that were ordered by Josh xxxxx of xxxxx construction about 2 years ago. I need to replace a damaged panel. The color was either Light stone or Tan. Can you confirm the color of the building? Thank you. In order to get the closest match possible, the panel should be ordered from the original manufacturer, who does not sell direct to the public. Please email our materials buyer Justine at materials@hansenpolebuildings.com with the length of the panel needed and she can get a delivered price for you. This entry was posted in Insulation, Building Colors, Pole Barn Heating, Sliding Doors and tagged insulation, building colors, sliding doors, Heating on August 27, 2018 by admin. The PBG answers questions about insulation, snow loads, and best choice for condensation. DEAR TIM: To begin with, I will surmise you have either a rather typical Midwest style post frame (pole barn) building with trusses spaced every four feet on top of “truss carriers” (headers) or a building with single trusses widely spaced somewhere from seven to 10 feet on center. You have a couple of choices – if you are going to utilize the existing intake (soffit vents) and exhaust (ridge vents) then a minimum of one inch of clear airflow must exist above the insulation. The high ribs of the roof steel will not provide adequate ventilation and there is really no way to create it after the fact. An alternative would be to seal the vents and use closed cell spray foam on the underside of the roof system. The closed cell foam should take care of any condensation concerns from the underside of the roof steel and it provides approximately an R 7 insulation value per every inch of thickness. DEAR JIM: Any snow load is very possible to be designed for, even those at high altitude snow ski resorts (including this one: https://www.hansenpolebuildings.com/2014/04/2014-winter-olympics/). Besides the snow loads in excess of 200 pounds per square foot at ski resorts, I’ve also provided post frame buildings in places like Glacier National Park, where the snow is so deep the park roads close for months in the winter. DEAR JOHN: My first choice would be closed cell spray foam. 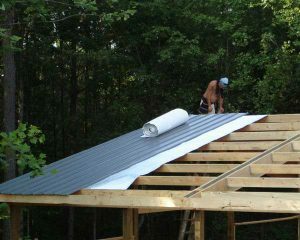 While it is going to be more expensive, you will save greatly in labor as opposed to using a radiant reflective barrier. Radiant Reflective Barrier, installed correctly, might give you the performance you are seeking. If you do go with the barrier, single cell will perform pretty much as well as single cell. Buy six foot wide rolls with a tab. The tabs should have a pull strip over adhesive, which eliminates the need for taping seams. The six foot wide rolls mean fewer pieces to handle and overlaps to seal. This entry was posted in Uncategorized, Insulation, Pole Barn Design, Ventilation and tagged insulation, snow loads, radiant reflective barrier, Venting on August 13, 2018 by admin. 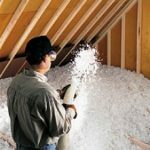 Regular readers of this column recognize insulation as being a hot (pun intended) topic of discussion – not just entire buildings, but also of a room or rooms in an unheated pole barn. “I have a 50 x 75 pole barn with 15 foot side walls. The building is 8 years old and is unheated; I did insulate the roof during construction to prevent the traditional roof condensation which has worked well. Currently, I am in the process of building a 22 x 26 shop in one corner of the barn which will be heated and cooled. On the two outside walls of the shop I placed 1 ½ inch foam board between each of the barn wall girts then built 2×6 stud walls in between the pole legs. I then placed built two remaining free standing 2×6 walls to complete the shop walls. I placed faced R19 insulation in all the stud walls and finished them off with ACX plywood on the inside of the shop and CDX on the outside (free standing) shop walls. I then placed 22 foot long TGI’s as ceiling joists so I can have storage above the shop which I then placed ¾ inch tongue and groove plywood on top. I am now at the point to insulate the ceiling and finishing it off with a suspended ceiling with a gypsum type ceiling tile. I plan on placing R30 unfaced insulation in each of the shop ceiling bays but don’t know if I should use a poly type barrier before putting up the suspended ceiling. I am concerned about moisture in the shop ceiling and issues that would cause. Normally ceilings do not have a vapor barrier because you want to have warm moist air rise and escape into the vented attic space. In your instance, you are creating a cavity which could very well collect moisture as the 3/4 inch T & G plywood is going to pretty much prevent moisture from escaping. If you use a vapor barrier on the underside of the TGIs, you have now trapped the moisture inside of the shop you have created. My instincts tell me to use the vapor barrier and be prepared to have some sort of exhaust fan to remove excess moisture in the room, or to have a dehumidifier. You can minimize the moisture in the room by using a good sealant on the top of the concrete slab. 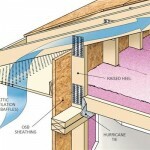 You might also look at using a product such as Roxul (https://www.hansenpolebuildings.com/2013/03/roxul-insulation/) in the ceiling, as its function is not reduced by any moisture which may become trapped in the cavity. 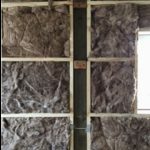 This entry was posted in Insulation, Pole Barn Questions, Pole Barn Design, Pole Barn Planning, Pole Barn Structure, Ventilation, Building Interior, Pole Barn Heating and tagged insulation, pole building insulation, pole barn insulation, adding insulation to a pole barn, unheated on July 31, 2018 by admin. Attic venting for post frame (pole barn) buildings is a challenge which can be resolved by the use of vinyl gable vents. “I have a pole barn with the ribbed siding, 3/4″ high ribs at 9″ spacing, with two smaller ribs in-between at 3″ spacing. I need to add end wall gable vents (because I failed to have it built with eaves) because I want to install insulation in the ceiling and walls. In reading your web information on gable vents, it seems that the vents you offer fit over the ribs as opposed to what I might find at my local Home Depot. Can you clarify whether the vent you provide fits over the ribs so that I can get a weather tight seal. If not indexed for the ribs, I am at a loss to understand how you can seal the vent against the ribbed siding. Any guidance you could share would be very much appreciated. 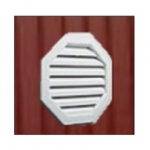 The Hansen Pole Buildings vinyl gable vents are designed with a “snap ring” which goes on top of the high ribs of the steel. To install, remove the snap ring and use the inside edge of it as a template to draw the location of the vent on the siding. Remember to cut just outside of the line, so the vent can be pushed through from the inside. Once it is pushed through, snap on the snap ring and you have a sealed vent! Just this easy and requires no extra framing. And it is square feet, not inches. In your case you would need to have at least three square feet of net free area venting on each endwall, and it would need to be located in the upper half of the dead attic space. Just as an example an 18″ x 24″ rectangular vent will typically provide about 140 square inches of net free area. 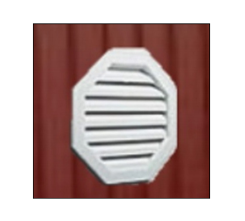 The 2012 IBC (International Building Code) ventilation requirements may be accessed here: https://codes.iccsafe.org/public/document/IBC2015/chapter-12-interior-environment please see 1203.2. 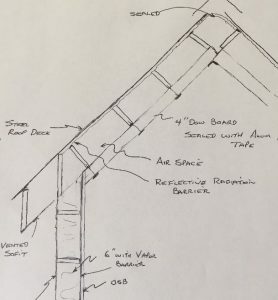 This entry was posted in Pole Barn Questions, Pole Building How To Guides, Ventilation and tagged insulation, International Building Code, pole barn insulation, vinyl gable vent on July 12, 2018 by admin. Retro Insulation, Cost of a Hipped Roof, and Slab Prep! 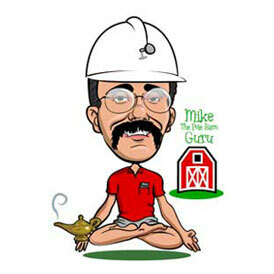 Today Mike the Pole Barn Guru answers questions about Retro Insulation, Cost of a Hipped Roof, and Slab Prep! DEAR MIKE: You should remove the wall steel, a wall at a time, placing a well sealed quality building wrap (like Tyvek) over the wall framing – then reinstall the steel siding. Use unfaced fiberglass blanket insulation, thick enough to entirely fill the wall cavity, then a 6mil clear visqueen vapor barrier on the inside before installing the gypsum wallboard on the interior. Make sure to tape all seams, tears or rips in the visqueen. DEAR PRESTON: I hate to break this to you, but contractor number one is clueless – post frame (pole barn) style is going to be less expensive than stick frame, for a full hipped roof (or any roof style). The $3800 more for a set of hipped roof trusses sounds fairly steep unless you are somewhere with a significantly high snow load. My recommendation – order a fully engineered post frame building kit package and then have a competent contractor assemble it for you (or save some real money and assemble it yourself). DEAR RON: Prior to pouring, 2” to 6” of clean and drained sand or sandy gravel is spread below where concrete is to be poured. Mechanically compact fill to at least 90% of a Modified Proctor Density, so as not to cause slab to sink. Install a good vapor barrier below any interior pour, to stop moisture from traveling up into slab through capillary action. Place 3” to 4” of clean and drained sand on top of the vapor barrier, to decrease differential drying shrinkage and floor curling. This sand over the vapor barrier will facilitate water drainage during curing time and accelerate installation. This entry was posted in Insulation, Pole Barn Design, Pole Barn Structure, Trusses, Concrete and tagged insulation, visqueen, Hipped roof, Hipped roof trusses, Gravel, concrete preparation on May 28, 2018 by admin. Earth Work, Pole Barn Conversion, and Insulation Issue? DEAR STAN: The rationale behind installing the columns first is very few people have fill adequately compacted when they bring it in. I’ve written a series of articles about proper site preparation and compaction which begins here: https://www.hansenpolebuildings.com/2011/11/site-preparation/. For most, it is easier to just order columns two feet longer than normal, embed them into undisturbed native soil per the engineered plans, then start construction with the pressure preservative treated splash plank held up far enough so as to have its bottom at the point of where the bottom of the finished concrete slab on grade in the building will be. Once the building is up, fill can then be brought in to bring the interior up to grade and create the needed slope outside of the building. The IBC (International Building Code) requires a 5% slope away from buildings where surfaces are not impermeable. DEAR KENNY: You should remove the wall steel (one wall at a time) and install a housewrap between the wall framing and the wall steel, then reapply the siding after making certain any tears or seams have been properly taped. If you use unfaced fiberglass wall insulation you should place a 6ml clear visqueen vapor barrier on the inside (running from concrete slab to the bottom of the trusses), immediately prior to installing the gypsum wallboard (or other interior finishes). Again make sure to seal all rears or seams. You should not have a vapor barrier between the ceiling framing and the drywall on the ceiling. DEAR DOUG: You do not want a vapor barrier between the insulation and the siding, you DO want a building wrap (such as Tyvek). You should remove the wall steel, a wall at a time, install housewrap then put the siding back on. Use unfaced fiberglass batts and then a clear visqueen vapor barrier on the inside (make sure to seal any seams, rips or tears. This entry was posted in Insulation, Pole Barn Design, Ventilation, Building Interior, Pole Barn Heating and tagged insulation, barn conversions, Dirt work, earth work, grading, Conversion on April 16, 2018 by admin. 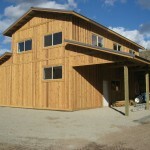 Long time readers of this blog have seen ample posts about energy efficient post frame (pole barn) buildings. 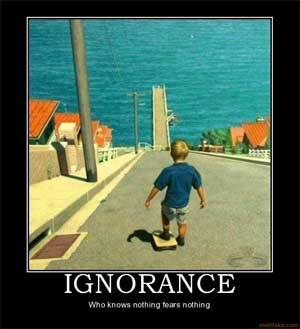 As most are aware, there is as much bad information (maybe more) than good available on the internet. Whilst I’d like to believe Martin Holladay at www.greenbuildingadvisor.com is fairly knowledgeable – when it comes to his answers on this particular subject, he has (in my humble opinion) missed the mark. Maybe the thought of all post frame buildings having dirt floors should be thrown out of the discussion. 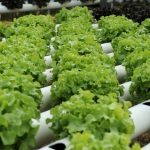 From experience the only post frame buildings which have dirt “floors” are ones which are always going to be pure agricultural or storage buildings and will never be climate controlled, or they are dwellings with wood floors elevated above a crawl space. The air barrier issue for post frame construction is resolved the same way a stud framed building would be – utilize a quality building wrap between framing and siding, then insulate between girts (think studs run horizontally). Thermal transference in walls can be reduced by having an interior set of wall girts to support inside finish surfaces such as gypsum wallboard. This is far less material intensive than the double studwall system promoted by some stick frame builders. 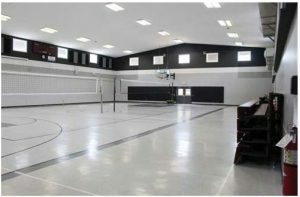 Wall insulation for post frame buildings can run the gamut from unfaced fiberglass batts, to BIBs (https://www.hansenpolebuildings.com/2011/11/bibs/), to closed cell spray foam or combinations thereof, just like studwall construction. Top of wall to insulated ceiling transition is the same for either form of construction. 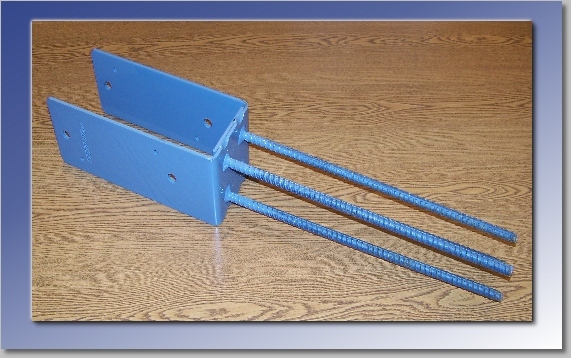 Raised heel trusses (https://www.hansenpolebuildings.com/2012/07/raised-heel-trusses/) allow for full thickness of insulation above the perimeter walls, and should be utilized in any case with a climate controlled building. For slab on grade applications frost-protected shallow foundations (https://www.hansenpolebuildings.com/2016/11/frost-protected-shallow-foundations/) are a practical solution, with post-frame holding an advantage in not having to have a thickened edge of the concrete floor. Designing for energy efficiency? Look no further than post frame construction – at the corner where energy savings and cost savings meet! This entry was posted in Insulation, Pole Barn Design, Pole Building How To Guides, Ventilation and tagged insulation, post frame building, pole barn insulation, SIPS, structurally insulated panels on April 13, 2018 by admin. One of our clients has been erecting a post frame home in Colorado Springs, which is over a crawl space. Here is our discussion in regards to insulating the crawl space. When I moved to Oregon from Eastern Washington in 1979, I was amazed at how different the construction techniques were from what I had grown up with. Eastern Washington was the land of full basements, whereas Western Oregon was predominately crawl spaces. The typical crawl space would have 6 mil black visqueen draped down the sides of the foundation and covering the ground, with R-19 unfaced batts used to insulate directly beneath the floors. A variant of this was to use the crawl space as an air plenum, eliminating the need for heat ducts, and placing the unfaced insulation against the foundation. This variant is basically a very slight spin away from what you propose to do. Performance charts always frighten me as they general require some hocus pocus involving dead air space. Closed cell spray foam is R-7 per inch, so a claim of three inches in a system making R-30 sounds bogus unless the balance of the cavity is going to be filled with something like unfaced fiberglass batts. There is no question about closed cell spray foam being expensive, even the work I had done when we added the elevator shaft on the back of our home ran $2.80 per square foot for four inches thick. Personally, I have no issues with what you propose to do and would probably take it a step further and utilize the principles of Frost Protected Shallow Foundation insulation below the base of my wall steel. https://www.hansenpolebuildings.com/2016/11/frost-protected-shallow-foundations/. This entry was posted in Insulation, Pole Barn Questions, Pole Barn Design, About The Pole Barn Guru, Pole Barn Homes and tagged insulation, BIBS insulation, spray foam insulation, unfaced batt insulation on February 1, 2018 by admin. DEAR PATRICK: Hansen Pole Buildings provides complete custom designed and engineered post frame building kit packages which are aimed towards the average individual who can and will read instructions in English to successfully erect themselves. In the event you are not so inclined, we can assist you in finding several builders in your area who have the interest in assembly of the building for you. DEAR BOB: Certainly you can use fiberglass wall insulation for post frame buildings. The question is, how? 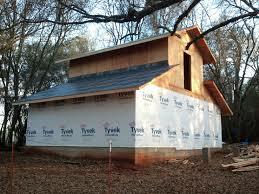 To do so, you should have building wrap (think Tyvek) between the siding and any wall framing. If your building was not engineered in this fashion, closed cell spray foam insulation can be applied to the inside of the siding, then unfaced fiberglass insulation can be installed with a clear visqueen vapor barrier on the inside. DEAR CARMICHAEL: Thank you for your interest in a new Hansen Pole Building. 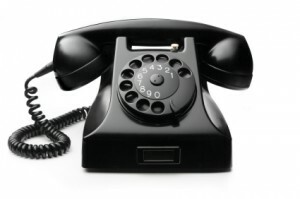 In most cases, the quickest way to get the information you are looking for is to call (866)200-9657 and ask to speak to a Building Designer. You can get a relative price by visiting https://www.hansenpolebuildings.com/pole-barn-prices/ where you can further customize a building based upon some standard and cost effective dimensions. In most cases, buildings with widths which are multiples of six and lengths which are multiples of 12 will result in the best value for your investment. If either security or convenience are at question, you may wish to consider sectional steel overhead doors, rather than sliding doors. This entry was posted in Insulation, Pole Barn Design, Constructing a Pole Building, Pole Barn Planning and tagged insulation, tyvek, Quotes, DIY on January 15, 2018 by admin. DEAR JASON: As you probably found out on your last post frame building project, they are far more than just simple barns, especially when they get to this sort of footprint. Our buildings will not be the least expensive, as there is always going to be someone out there who is willing to sacrifice quality for price. What you will get is the best possible building value for your investment. You will be hearing from one of the Hansen Pole Buildings’ Designers shortly. DEAR BRYENT: Yes – it is essential you have a vapor barrier between the roof purlins and the steel roofing. I would recommend using A1V (aluminum one side white vinyl inwards toward conditioned space. Hansen Pole Buildings has six foot net coverage rolls in stock for immediate shipment. These rolls have a tab on one edge which has an adhesive pull strip – so no rolls of tape to deal with. Code does not allow for gable vents to be used in conjunction with eave and ridge vents. It is one or the other and I would pick eave and ridge for the most uniform ventilation. DEAR STEVE: Technically a “pole barn” is a post frame building. Below is the definition for a post-frame building system from ANSI/ASABE S618 Post-Frame Building System Nomenclature. This standard was written to establish uniformity of terminology used in building design, construction, marketing and regulation. This entry was posted in Insulation, Pole Barn Questions, Pole Building Comparisons, Roofing Materials, Pole Barn Planning and tagged insulation, pole barn, A1V, post frame construction, Quotes, free quotes, Barrier on November 27, 2017 by admin. DEAR TRENT: I will give you the straight answer, because I have no skin in the game. All I care about is you get the best possible building for your investment. The answer is you need to either get the bubble wrap out of your walls, or poke numerous holes in it so moisture does not become trapped in the insulation cavity. Personally, I would remove the wall steel, one wall at a time. Pull out the radiant barrier, replace it with Tyvek or a similar performing building wrap, then put the siding back on. While it sounds daunting, it should actually go fairly quickly. I’d use BIBs insulation in the walls with a six ml clear visqueen vapor barrier on the inside of the framing. DEAR POLE BARN GURU: Hello, this question seemed kind of answered in your FAQ, but I wanted to take a moment and ask anyways, as your website really seems to convey desire to work with the customer as well as a care for quality. I’ve loved reading the Questions to the Guru! Without getting into too much detail, I have acres of Loblolly Pine that I will be building an Event Center Barn out of. I’ve got a miller who’s working at some really great rates. I’m looking for an engineer to put all my thoughts on the barn together and stamp em so I can get going on the permit process. Do you all provide JUST the engineering service, I wouldn’t be buying any material from you all, but I would of course supply all the information on the materials I’d like to use, look of it, etc. If you all don’t, do you think one of your engineers might be interested in privately contracting it? Again, I ask only because you all seem like a great organization. DEAR JACOB: Thank you very much for reaching out to us. Top quality is a high priority to us. We and our engineers do not provide just engineering services, due to the inability to control the quality of materials which go into the completed project. 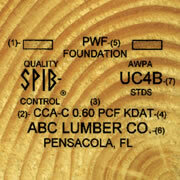 A concern about your choice of building materials – your Loblolly Pine should be both dried to a moisture content of 19% or less and be grade stamped in order to be used in an engineered building. You are probably ahead of the game to sell your timber and purchase the lumber with the proceeds of the sale. DEAR RYAN: It will depend upon how you are supporting the liner panels. In our typical buildings, with double trusses spaced usually every 12 feet, we place joists every four feet between the truss bottom chords and run the steel the width of the building. If your trusses are spaced every four feet, you could safely attach the steel to the bottom of them and run the length of the building. I have heard of cases where trusses have been spaced every eight to 10 feet and people have attached the liner length of the building to the bottom of the trusses with no other framing supports. Personally I feel the deflection of the steel between trusses would be unsightly. This entry was posted in Uncategorized and tagged insulation, engineering, tyvek, steel ceiling liner panels, wrap, services on October 16, 2017 by admin. Premature Roller Wear, Proper Insulation, & Venting! DEAR BRAD: If these are round Plyco trolleys, your door must be very heavy. I say this because I have never heard of one failing and we have thousands of sliding door in use by our clients. With this said, placing another one in the middle will probably result in the door sliding unevenly due to the slightly larger (due to no wear) new trolley in the center. Plyco does have what is referred to as a “double truck” trolley. These will replace your existing trolleys and each has two sets of wheel pairs. If you have a heavy sliding door, these are probably going to be your solution. DEAR OVERTON: Could or should? Not the same question. You should be blowing at least R-45 of cellulose or fiberglass into a properly vented insulation cavity. If you do not have adequate thickness at the top of the walls, Add high R insulation boards as baffles so at least 2” of clear airflow comes through from the eaves. Then have closed cell spray foam insulation added until the R-45 blown in can reach full depth. Generally this should be about four feet from the walls in standard residential stick frame construction. DEAR MIKE: The ridges of the steel will not provide adequate airflow. Plus, they should be sealed off with inside closure strips to prevent flying critters from entering your building. If you do not vent the ridge, you can meet the ventilation requirements with gable vents. 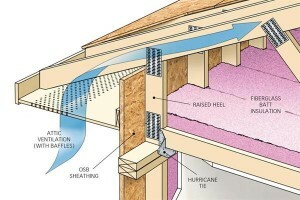 Read more on attic insulation for post frame buildings here: https://www.hansenpolebuildings.com/2014/02/pole-building-ventilation/. This entry was posted in Insulation, Pole Building Doors, Ventilation and tagged insulation, Ventilation, Rollers on October 2, 2017 by admin. DEAR COREY: This is why I always encourage clients to order their doors along with their building kit package. The kit suppliers will insure the door provided will fit in the building! Your circumstance should have been easily solved by whomever supplied your overhead door and is really fairly simple. By using high lift track the door can go up the inside of the endwall several feet, then the track will curve leaving the door, when opened, parked between the endwall and the first pair of trusses. This also puts the overhead tracks up below the bottom of the trusses and out of the zone where things might run into them. 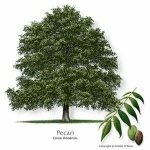 DEAR STEVE: You should not build within 15 feet of a pecan tree, due to the tremendous amount of moisture they take from the ground. You also want to consider the possibility of branches falling from the tree and hitting your new building. If you remove the tree, the ground in the area of the tree’s root system will probably swell, due to the ground water no longer being removed by the tree. This swelling can cause heaves to both embedded building columns as well as concrete slab on grade floors. DEAR RAY: If your new pole barn (post frame building) was designed with raised heel trusses and for the trusses to carry a ceiling load, I’d be looking at blowing in R-60 fiberglass or cellulose above the finished ceiling. This requires adequate ventilation – either 260 square inches on net free area at the eaves and ridge, or the same in each gable end in the top ½ of the attic space. This requires an air baffle to allow air to flow in from the eaves above the insulation. Don’t have raised heel trusses? Then use high R value rigid insulation board in areas where blown insulation would be compressed. Trusses not designed to support a ceiling? If this is the case, then closed cell spray foam the underside of the roofing. It will take between eight and nine inches of thickness to achieve R-60. If you have housewrap under the siding, you did right. In this case I would install another set of 2×4 girts on the inside of my walls, then use BIBs wall insulation. Place a clear 6ml visqueen vapor barrier on the inside and then gypsum wallboard. No housewrap? Then closed cell spray foam is the route to go. Four inches will get you to R-28. This entry was posted in Insulation, Pole Barn Design, Pole Barn Planning, Pole Building Doors, Columns, Sectional Doors and tagged insulation, insulation types, post holes, Headroom, High Lift track, ground swell on September 11, 2017 by admin. Roof Trusses? Contractor Reviews, and Insulation Installation! Is this something that you can help with — the design & manufacture of the trusses/roof? DEAR NATHAN: Your Building Department is going to require engineer sealed plans in order to issue a building permit for your project. As such, your best bet is to hire a local engineer who is experienced in wood frame construction to provide your plans. They should come out to your house and do a thorough investigation into the adequacy of the structure to support the loads. Some thoughts to consider – SIPs are going to prove to be very expensive. You could create a more spacious feel by constructing a knee wall on top of one of the existing walls, then use I joists or parallel chord trusses – either of which can be insulated between to give an adequate R value. DEAR GINGER: Getting independent customer reviews on any building contractor anywhere is a challenge, as most builders do not construct enough buildings to develop much of a track record either good or bad. Here are the seven steps to not getting yourself burned by any contractor, follow these: https://www.hansenpolebuildings.com/2013/07/contractor-6/ and require a performance bond and you will greatly limit your risk of not getting the finished product you expected. Here is Performance Bond information: https://www.hansenpolebuildings.com/2012/07/contractor-bonding/. DEAR POLE BARN GURU: I will be installing insulation under the steel roof. Are staple guns the best choice for temporary stabilization until the roof is added? What length staples? Which gauge staples? Narrow? Electric, air or grip staple gun? Recommendations? I will be using metal tape to join each roll of insulation side-by-side. 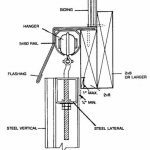 DEAR RALPH: From Chapter 14 of the Hansen Pole Buildings’ Installation Guide: Using a minimum 5/16” galvanized staple, staple through insulation to eave purlin top. As an alternative to staples, 1” galvanized roofing nails (with the big plastic washers) also work well. These fasteners are only going to be needed long enough to get a sheet of steel on top of them, so there is no occasion to get fancy at this juncture. I’ve found a tack hammer to be more than adequate. Keep in mind, the one edge of each roll of A1V insulation has a pull strip on it, with adhesive under the pull strip. 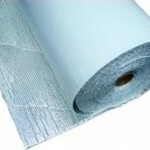 This eliminates the need to use rolls of tape to adjoin each piece of insulation. This entry was posted in Insulation, Pole Barn Design, Building Department, Pole Barn Structure, Trusses, Professional Engineer and tagged trusses, insulation, A1V, contractors, nails, Plans, code, reviews, staples on July 8, 2017 by admin. Design for Spray-Foam, Sonotubes, or Proper Fasteners! DEAR WADE: Thank you very much for your investment in a new Hansen Pole Building. If you have an opportunity to do so, I would enjoy seeing photos of your completed building, as it has some unique features which other clients would appreciate seeing. (https://www.hansenpolebuildings.com/2011/09/commercial-girts-what-are-they/) and use housewrap between the girts and the siding. 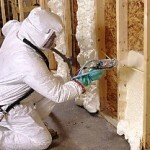 As we are past this point, my best recommendation is going to be closed cell spray foam (read more about spray foam here: https://www.hansenpolebuildings.com/2016/07/advantages-spray-foam-over-batt-insulation/). It is not inexpensive however it is very effective and can be sprayed directly onto the inside of the wall steel. DEAR CHRIS: I’ve actually been to Alpena! My first choice is always to dig holes to solid bedrock, probably requiring a backhoe. If the rock is such as to leave you with craters, sonotubes can be used to reduce the amount of concrete backfill required around the columns. If the bedrock is fairly shallow, or not below frost depth, the columns can usually be designed by the building engineer to be rebar pinned to the bedrock to prevent movement. DEAR POLE BARN GURU: I recently bought a property and the 20 yr. old pole barn that is leaking inside from the eves on the sides. I have excessive overhang 4.5 inches on one side and 5 inches on the other. According to your sight, it should be 1 1/2 to 1 3/4. How do I repair/fix this problem? DEAR DALE: Your challenge probably has nothing to do with the distance the roof steel overhangs past the sidewalls. The ideal length (1-1/2 to 1-3/4 inches) is based upon getting the runoff water from the roof directly into a gutter, without having the water just sailing over the top. If your building is only leaking along the eaves, then it is a function of the original builder having used the industry standard #9 diameter screws. Over time, the cyclical nature of windloads will cause these small diameter screws to act like knives, cutting away at the surrounding steel until slots have formed around the screws – and water then leaks through the slots. Provided this is indeed the problem, and the slotting is not too excessive, it can be fixed by using #14 diameter screws, which are greater in length than the existing screws. Remove all of the current screws at the eave, place the larger and longer screws back through the same holes and as long as no slots extend past the grommets, you have the job half done. Probably the roof only has screws on one side of the high ribs along the eave, if so, add another large/long screw at the other side of each high rib. The eaves and ridge are where roof shear forces (from wind) are the greatest. By adding the extra screws, it reduces the lateral force on each of the screws along the eaves. If the slots are too great to be covered by a new fastener, the solution is to replace the roof steel and install it using the correct screws and with a pattern which will prevent the same problem from happening again in the future. This entry was posted in Insulation, Pole Barn Design, Roofing Materials, Steel Roofing & Siding, Fasteners and tagged insulation, leaking roof, sonotubes, fasteners, bedrock on March 20, 2017 by admin. DEAR POLE BARN GURU: Could you give me a cost of installation of spray foam insulation for an indoor horse arena that is 65 by 125 ft in size. DEAR JACK: Thank you very much for your interest. 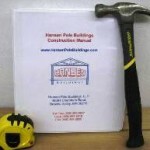 Hansen Pole Buildings is neither a contractor nor an installer. For closed cell spray foam (which is what you want to have), you should expect to pay about a dollar, per square foot, per inch of thickness. DEAR POLE BARN GURU: I found your web site and wanted to reach out to you. I provide free safety consultation services to small employers in Ohio. I have a small framer who does Pole Barns and he was cited by OSHA. He needs a written Safety and Health program that addresses all of the applicable topics to this trade (Fall protection, Electrical and Ladder safety, PPE, tool safety, etc.) I have never written a program for a contractor who does this type of work and was wondering if you could suggest any other links or resources that could help me with putting one together for me. He is Amish and has no computer resources so I feel I need to do what I can to help. I especially need some guidance with regards to Fall protection during the building process (tie off points, what can be used as an anchor, truss erection, etc.). Please provide what you can to me. DEAR PAULA: I’d start with www.nfba.org, they are the trade association for the post frame (pole) building industry and should be able to either provide what you are looking for, or get you pointed in the correct direction. DEAR JERRY: The determination for which side goes in or out will be based upon the goal you are trying to achieve. If you want to reduce heat gain in the summer, then the shiny (aluminum) side will go out, if you are heating the space and want to reflect the heat back into the building, then shiny side in. Some thoughts – whether installed under the purlins or as a ceiling across the roof truss bottom chords, you have created a dead air space above the insulation boards which must be ventilated from eave to ridge or at the gables in order to prevent condensation, mold and mildew issues. In order to function properly, all joints and seams must be sealed tightly. Before installing any product which will be supported by trusses, confirm they have the load carrying capacity to support it. Many Building Departments require any foam sheathing to be fire separated from areas where humans will occupy. This could add to your expense. This entry was posted in Insulation, Pole Barn Design, Ventilation and tagged insulation, polyiso, safety, load capcity on March 6, 2017 by admin. DEAR DELLA: Unless I am mistaken, I believe your question is about insulation, rather than installation. My guess is it may be on the expensive side, but if it works, it could be quite the trick. I am in the process now of getting a quote with the idea of using it between the framing and steel when I reroof my house near Spokane, Washington. DEAR JUSTIN: In the case of most structural construction on low rise buildings, the cost of labor is typically equal to about 1/2 of the cost of the materials. Obviously steep slopes, multiple hips and valleys, pitch changes (basically more complex roofs) will add to the cost. DEAR POLE BARN GURU: The detail for setting posts shows 8” concrete under the posts and up 18” on the posts. DEAR JIM: While I am unaware of any video Hansen Pole Buildings has produced which shows a two stage pour, it can certainly be done. I usually try to avoid it just for the fact I am frugal and do not like to pay the short haul charges from the premix company. By pouring it all at one time, you can also speed up the construction process by a day, as you will not be waiting for two sets of concrete cures. This entry was posted in Roofing Materials, Steel Roofing & Siding, Concrete, Footings and tagged insulation, Concrete, R-50, labor on February 27, 2017 by admin. DEAR POLE BARN GURU: Good morning. 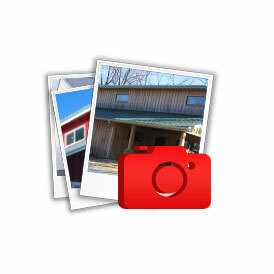 I have been reading the various blog entries for several days, regarding pole barn construction. I have been in contact with your design professional, but I a question that I thought might be a question that could possibly benefit others with a similar situation. I am in the process of planning a 40X60 building for a shop for the business I have. My planned (and only available) location has about 5′ of fall on the lot which would be on the 60′ side wall of the building. I have built up a 50 X 70 pad. This has been built up and compacted with red “clay” a term we use around here, referring to the material we call “fill” around here, generally used for the purpose of building up a building pad. My original thoughts were to place a 6″ thick monolithic concrete pad with a footer, (I intend to run forklifts on it.) and erect a steel building kit. Since the dirt pad was completed, I have since stumbled onto your site, and am looking at a pole building. So, my question relates to setting poles. How do you handle setting poles when half of the building will be over the top of built up soil base? I know it can be done, and I am not concerned overly much with adequacy of the soil compaction, which at this point, it has been sitting for about 7 or 8 months since it was compacted, but it has not been tested for compaction. But having never done this before, since I am not 100% sure, and have yet to dig holes, (but I do want to start later this spring) I wanted to know your thoughts before I proceed. DEAR WESSLEY: And a fine good morning to you! I believe you are going to find a post frame (pole) building to be a much more viable option for your new structure than all steel and this is why…. Although your fill has sat for 7-8 months, there is yet a chance of additional settling. Clay is also a very unstable soil to place footings upon – so if your consideration was to support a monolithic pad with a footing around the perimeter, unless the footing was at the depth of the undisturbed underlying soil there is a high degree of probability the building would settle or shift – leaving you an unhappy new building owner. With your pole building – the columns which will be placed in the fill area should be ordered long enough so the base of the column (actually the concrete below the base of the column) will rest upon virgin soil. This will require some holes to be as deep as five feet, however most skid loader mounted augers will get this kind of depth. The columns placed in this manner should minimize the probability of issues from settling and give you a resulting structure which can be happily used for several generations. 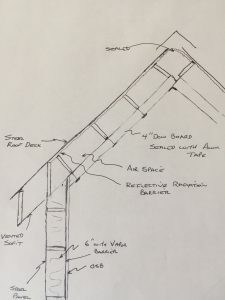 DEAR JIM: At the bare basics – the trusses will have one or more of the following: higher grades of lumber used for top and or bottom chords; large lumber for top and or bottom chords; more internal truss webs; larger pressed steel connector plates. Now some recommendations – when you have a ceiling, ventilation is required. The best way to do it is to have enclosed vented overhangs and a vented ridge. This gives both an air intake as well as an exhaust and gives smooth airflow throughout the entire enclosed attic space. If you are planning upon insulating the ceiling, raised heel trusses are the way to go (read more on the hows and whys of raised heel trusses here: https://www.hansenpolebuildings.com/2012/07/raised-heel-trusses/). You get one opportunity to do your new building right or wrong, I’d sure like to see it done right! DEAR PATRICK: I am going to give you the answer you probably don’t want to hear…..the water staining is most probably due to roof leaks, rather than condensation. This happens when screws are placed through foam board, which causes the screw shanks to deform, slots to form beneath the screw heads and when the deformations or slots get large enough – it leaks. The best solution for the problem is to remove the roof panels, take out the insulation boards and throw them away, then reinstall the roof panels using 1-1/2 inch long screws with a larger diameter than what was previously used. Placing any sort of batt insulation under the foam as it currently exists is just going to get you wet insulation. 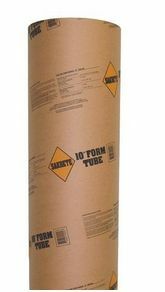 Trying to use R-19 insulation batts in a 3-1/2 inch cavity will net you R-13 as the insulation is only as effective as its fully expanded thickness. Once you have removed the foam boards the solution seriously is to spray foam it. Code requires airflow from eave to ridge over the batt insulation, which is going to involve more work and cost than the foam – it would take two layers of 2×4 laid flat on top of the existing purlins, one set running up the roof and another set going the same direction as the purlins, to screw into. This will mess up any trims on the perimeter of the roof, resulting in purchasing larger coverage trims. The original building owner’s lack of planning for future uses of the building have now become your expensive nightmare. This entry was posted in Insulation, Pole Barn Questions, Pole Barn Design, Building Overhangs, Roofing Materials, Pole Barn Planning, Pole Barn Structure, Steel Roofing & Siding, Ventilation, Concrete, Building Interior, Columns and tagged insulation, Ventilation, post depth, dirt pad, fill, overhang on February 20, 2017 by admin. DEAR POLE BARN GURU: Do you have to set laminated pole so you see the 1.5 side of the 2×6’s while looking in or out of the building? I was thinking of using 4ply 2×6 post 10′ out of the ground every 8′ while book shelving with 2×6’s in between posts. I thought it would be a lot faster to notch both sides of the post for the 2×10’s to sit in, just cutting out one 2×6 off of each side leaving 2 in the middle seems a lot faster than notching all 3 plays on a standard laminated post. My building won’t be very high and I heard book shelving greatly improves racking from side to side. Was planning on the book shelf being 2’OC didn’t know if going 16″OC would improve this design or if it is just unheard of turning the post sideways. I do understand that this makes the post 5.5″x6″ but the extra .5″ is of no concern since it is for a garage and I will just be sheeting it with 7/16″ OSB anyway. DEAR CHRIS: If by laminated you mean a true glulaminated column – then you can set it any direction as it has become a true one piece unit. If you are talking nailed up columns, or ones which use nails and construction adhesive (or through wires), those must be set with the 1-1/2″ sides of the 2x6s towards the wind. A 4ply 2×6 glulam will measure 5-1/2 inches by 5-3/8 inches, so there is no extra 1/2 inch to worry about. Now I will totally upset your apple cart – how about doing away with the truss carriers entirely? And place the columns every 10 or 12 feet, instead of every eight? You can use a double truss system, with purlins on edge between the trusses and eliminate about 50% of the pieces you would otherwise need to handle and install – with the added benefit of not having to drill so many holes!! You can view sample plans for post frame buildings constructed in this fashion here: https://www.hansenpolebuildings.com/sample-building-plans/. Book shelf girts are going to be far stronger against wind loads, I’ve used them on all of my current buildings and wouldn’t do them any other way. Two foot centers will adequately support far greater loads than will ever be imposed on most buildings. DEAR DAVID ~ Depending upon how far you are spanning between trusses or ceiling joists there may be a fair amount of sag – however it should work as long as you can adequately attach the material. I’ve seen people use chicken wire stapled to the underside of double trusses which were spaced every 12 feet to support unfaced insulation batts. DEAR BRANDON: Here is the link to the application on the Hansen Pole Buildings website, please fill it out completely in order to be considered: https://www.hansenpolebuildings.com/hansen-buildings-contractor-program/. This entry was posted in Lumber, Insulation, Pole Barn Design, Pole Barn Structure, Building Contractor, Trusses and tagged insulation, bookshelf girts, glu-laminated posts, notching, certified contractor on February 6, 2017 by admin. If you’re thinking about building a pole barn home (or ‘barndominium’), you no doubt already know that construction and labor costs for this type of residence can be significantly lower than the cost of building a traditional house. However, you may be wondering what your monthly utility bills will look like once you move in. Can pole buildings be energy-efficient, or will you end up losing money trying to heat and cool your home? In our years of experience at Hansen Pole Buildings, we’ve learned that pole barns can be energy efficient—as long as you install proper installation. The greatest majority of heat loss or gain is through a home’s roof, and this can be especially pronounced in pole buildings with high ceilings. To avoid sky-high utility bills, we recommend that you install a reflective radiant barrier under the roof of your pole barn. It doesn’t change the construction process for the pole building, and it can provide considerable savings over time. 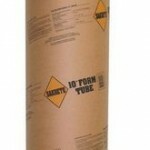 At Hansen Pole, we offer A1V insulation. 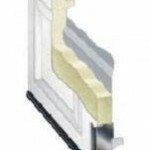 This is a type of insulation with a closed layer of air cells in between reflective aluminum facing on the exterior and white vinyl facing on the interior. Its system r-value can be as great as R14 against heat gain, although the exact r-value will depend on a number of factors, including wind, humidity, and temperature. If you’re interested in learning how to install this cost-effective insulation, check out this previous blog post. While the insulation you install will play a major role in determining how energy efficient your pole barn is, the roof you choose will also make a difference. Lighter color roofs are typically better in warm climates because they will reduce heat absorption, which will help prevent the building from becoming too balmy in the spring and summer. When working with us to put together a custom pole building kit, you can get a light-colored roofing material that is Energy Star certified. To get the Energy Star stamp of approval, a roof has to maintain a reflectance of at least 15% of the sun’s energy after three years of real-world exposure testing. The higher the reflectance, the less energy it will take to cool the home below. This simple feature will reduce your monthly pole barn energy costs. Adding energy-efficient features to your pole barn home may add to the upfront building cost, but will save you money in the long run. For more information about residential pole buildings, visit Hansen Pole online and start planning for your new building today! This entry was posted in Insulation, Pole Barn Design, Pole Building Comparisons, Building Styles and Designs, Constructing a Pole Building, Pole Building How To Guides, Pole Barn Planning and tagged insulation, pole building costs, energy efficiency on September 13, 2016 by admin. 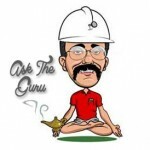 Dear Guru: What Type of Insulation? DEAR POLE BARN GURU: Good morning, Mike … I have a question for you. I’m trying to decide between a 30×40 barn and a 60×40 barn. It would have a gambrel roof with a loft. 16′ wide sliding door in the center of the short ends. All other things being equal, what is the cost difference between 30×40 and 60×40? Or is there a size that’s more economical? DEAR MIKE T.: Having to design the loft to support hay weight is not so much of a challenge as it is expensive. For sake of discussion the comparison was done a full loft, however it may be more practical to only have the loft in the center. There is an economy of scale with pole buildings. For practical purposes, the price per square foot is going to decrease as the building footprint increases (until clearspans become very wide). I’ve also never had a client tell me their new building is “just too big”! In your particular case, you could double the size of the building, while increasing the investment by only about 2/3. 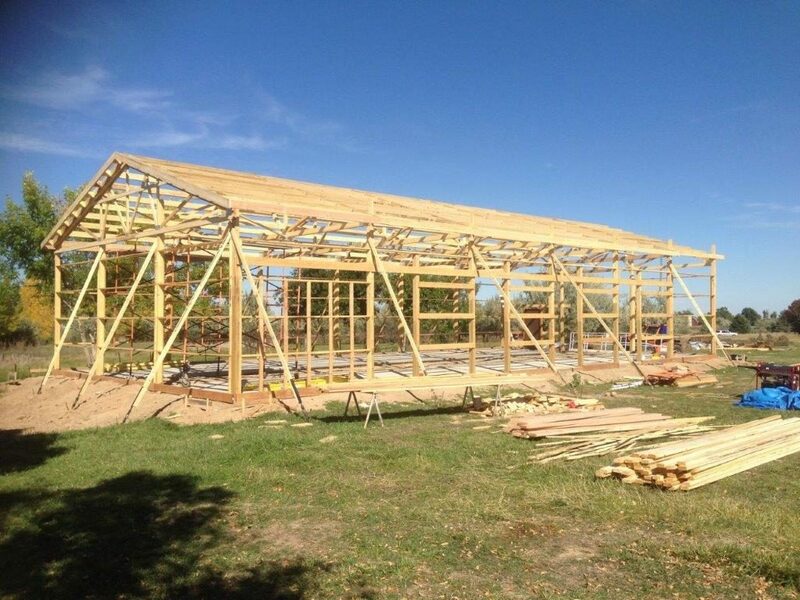 DEAR POLE BARN GURU: Renovating our pole building arena is an undertaking. We were quoted $70k (which included windows to replace the plastic) so we are doing it ourselves. I expect materials to run about $25k in the end. The company that sold me the metal ceiling panels based out of Kentucky told me that people in his area do it all the time and that the best way to go is with blown insulation, as fiberglass batting is a lot more time consuming to install. I decided against spray foam because it is toxic to begin with and then they put fire retardants in the mix which is even more toxic. Plus it is expensive. What will happen if we don’t have a “thermal break” on the underside of the metal roof? There will be a lot of condensation falling on the blown insulation? We have a roof vent which I guess is correctly installed because we never have water coming in even during the most violent and heavy of rain storms. Isn’t this vent enough to prevent condensation? If a herd of animals lived in the building, then I would worry about condensation, but there will be maximum 2-4 live beings in there at one time. Removing the roof to install a reflective radiant barrier is not an option. How about covering the underside with “Tyvek” the stuff houses are wrapped in? Are you saying the blown insulation on the ceiling will not do its job without this thermal break on the roof, or is it the condensation you are concerned about? What does the reflective radiant barrier need to reflect? Cold coming from outside, or heat coming from outside? We have blown insulation in our 14 year old house. I guess it is newspaper. It works a charm. We’re on a hill and it can blow out there and we’re cozy inside. One can buy cellulose from Lowe’s or Home Depot and they lend you a machine to install it. I was worried that wind from the roof vent would blow it around. I was also worried critters would nest in it, although we have covered such access with 1/2″ wire mesh. Nonetheless, critters are very resourceful about getting into things. I was worried that if it got wet it would get moldy. My daughter is very sensitive to mold. Best thing is it stays dry….and like I said, we never had rain come through that vent, although when the conditions were right, we’d get a bit of snow blown in. We have a lot of snow now, and no snow in the arena. So it has to be special conditions. I thought of covering the blown insulation with tarps to protect it from wind or moisture. Is that a good or bad idea? BTW, we have no intention of heating the arena. The goal is to have it warmer in there than outside….hopefully a little above freezing. I guess for the walls we will use fiberglass. The plastic panels will be replaced with double glazed “picture” windows (they don’t open) and will run the length of about 2/3 of the arena at 2′ high. A trainer we met from Maine said he insulated his riding arena and it really helped keep out the cold. I’m wondering what will happen in summer. Will it keep out the heat, or trap it? It’s great communicating with someone who knows what they are talking about. I’d be happy to compensate you for your expertise. P.S. Here’s a fiberglass story. The owner of a horse boarded at our farm had a plumbing leak in her basement. The plumber came and fixed the leak and left. Several weeks later she developed itching sores all over her body. She woke up one morning with arms so swollen she could not bend them and a face twice the size of normal. She went to the ER and they told her a dust allergy, so she threw out all drapes and mattresses, etc. and cleaned the carpet and whole place. However, it didn’t help and she landed in the ER again. Meanwhile they found out that the plumber had pulled away fiberglass insulation from the broken pipe, and because of the leak it was all wet. He didn’t remove the wet fiberglass and so mold developed, and with the furnace down there blowing hot air (with the mold) all over the living space it made her VERY sick. She moved out immediately and had to take a lot of nasty drugs, and she is still not well. Plus, inhaled fiberglass is a known carcinogen, as you probably know. DEAR CINDY: Without the thermal break under the roof steel, there will be condensation on the underside of the roof steel, which will result in rain upon the attic insulation. Ventilation alone may cure some, but not all of the condensation problems. The major source of the warm moist air rising is the ground under your building (evapotranspiration). According to www.ScienceDirect.com the average value of the moisture evaporation with uncovered ground is 0.33 to 0.53 gallons per hour per square foot. For a fairly typical 60 by 120 foot riding arena, this could be between 57 and 90 thousand gallons per day!! Housewraps like Tyvek are not vapor barriers – they are designed to allow moisture to pass through. 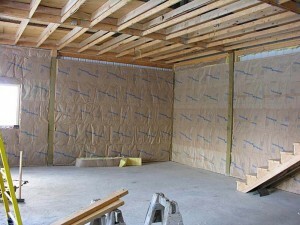 Reflective radiant barriers just happens to be a very cost effective thermal break. The aluminum facing on the exterior reflects radiant heat in the summer, keeping the building cooler. 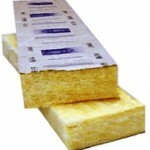 Insulating your building will keep it cooler in the summer, there is no question there. As to the effectiveness for keeping things warmer inside, without a heat source the air inside will be at or near the temperature on the outside. And thank you very kindly for your offer of compensation. I do my best to provide quality information for the good of the industry as a whole. If you feel I have been of service, please feel free to share the link to this blog with others. This entry was posted in Insulation, Pole Barn Questions, Budget and tagged insulation, tyvek, thermal break, reflective radiant barrier on April 27, 2015 by admin. Dear Guru: Why Vapor Barrier? 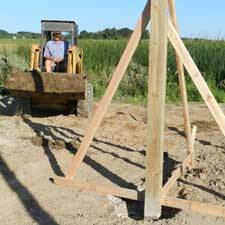 DEAR POLE BARN GURU: I constructed a pole building with the help of Iowa based Amish group. They put up the main structure including metal roof. Due to city codes, I enclosed the 40x60x12 structure using 1/2 osb, house wrap and then vinyl siding. I want to use paper faced 4x8x4″ Styrofoam sheets on the walls, and roll insulation for the ceiling. My question is, do I use a vapor barrier on the walls after putting in the Styrofoam or none at all? And for the ceiling I would assume I would attach a vapor barrier to the bottom side of the trusses and lay the R-25 unfaced insulation on top of that. I have ridge vent and soffit vents. Thanks for your help! Curt in Center Point, IA DEAR CURT: For a properly performing system, your building should have a vapor barrier on the inside of all walls. The paper facing on the Styrofoam™ panels should be a vapor barrier. In order to perform properly, you need to make sure all edges and joints are tightly sealed, to prevent moisture from entering the wall cavity. A vapor barrier should NOT be placed across the bottom of the roof trusses. If your building has steel roofing, I am hoping some sort of thermal break (like a reflective radiant barrier or similar) has been installed between the roof purlins and the roof steel, otherwise you are in for a plethora of problems. Warm moist air from your building needs to be able to pass through the ceiling and into the non-conditioned dead attic space, where it can be properly vented out of the ridge vent. You also should consider a greater R value in the attic. According to the North American Insulation Manufacturers Association https://www.naima.org/insulation-knowledge-base/residential-home-insulation/how-much-insulation-should-be-installed.html a minimum of R-38 should be installed in Iowa. This entry was posted in Insulation, Pole Barn Questions and tagged insulation, pole building insulation, attic ventilation, attic condensation, spray foam insulation, steel hail damage, Styrofoam, reflective radiant barrier on April 13, 2015 by admin. Dear Guru: When Do I Add a Reflective Radiant Barrier? DEAR MARCHING: I will assume your question pertains to a building with steel roofing to be installed over the roof purlins. 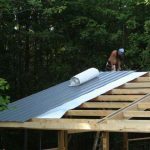 If this is the case, you should install a reflective roof insulation with adhesive pull strips to seal the joints over the purlins and beneath the roof steel. 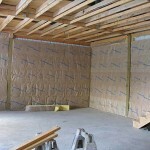 Check out www.buyreflectiveinsulation.com And yes, you can still insulate and finish the interior later, but the reflective radiant barrier should be installed during initial construction. We also are unable to provide plans as a .dwg, as it would allow them to be edited from their original format. Whether intentional or by accident, changes could be made which would compromise the structural integrity of the finished building. DEAR VASCILLATING: Yes, this style of building is very flexible and allows for a multitude of options. We have the plans for every custom building we have ever provided, however the differences in climactic conditions (snow, wind and seismic) from one individual site to another, as well as potential differences in Building Code editions make it impossible to reuse them. Once you have invested in your new Hansen Pole Building kit package, plans specific to your exact requirements will be produced for you. 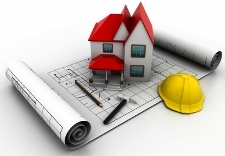 These plans are included in your investment price. This entry was posted in Insulation, Pole Barn Questions and tagged insulation, pole building plans, pole barn insulation, pole buiding insulation on September 22, 2014 by admin. My lovely bride and I have been married for heading on 15 years. To some, this may seem like a lot, to my grandparents and great-grandparents (who were together for 50 years and more) – hardly a drop in the bucket. In most relationships, success (or lack thereof) is created by communication. Lots of clear, concise dialogue makes for a happy marriage (whether a marriage of two partners in matrimony, or between client and pole barn provider). Don’t talk so much, or don’t pay attention to what the other party is saying, and a rocky road can result. Well, my first suggestion would be we do not have to be threatened to get action. In fact, we believe so much in the buildings we provide, we will put the information out ourselves! Any client who writes in order to have a problem solved, we appreciate kind, considerate and “moving forward” efforts. We most definitely will do everything we can to see their issue is solved in a timely manner. Go do in internet search for “pole barn (or pole building) problems (or horror stories)”. You will find a few of them – and in regards to a select few providers or builders – lots of them. To the best of our knowledge, there is not a single derogatory posting about Hansen Pole Buildings anywhere on the internet. After providing thousands of pole building kit packages since 2002, this says something about the integrity of our company and the quality of our products. 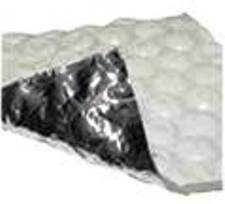 The original building kit package included reflective roof insulation manufactured by a Canadian company which is no longer in business (and was closed prior to the client’s notification of an apparent issue). Upon doing some research, the best guesses as to why the originally supplied insulation was delaminating (the inside white vinyl facing was flaking off) was due to either the adhesives used in fabrication by the manufacturer, or improper storage of the product onsite by the purchaser. Having used this manufacturer’s product in thousands of buildings, we had only ever received a handful of concerns with this issue. 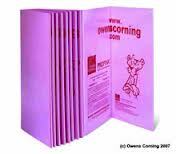 As the client reports, we did (and still would) offer to supply replacement insulation manufactured by our current supplier (which is produced using a better adhesive). Sidebar: the originally provided and installed insulation still is working as an effective condensation control, it just flakes off pieces of the white vinyl. “Fade or change in color in excess of five (5) units of color difference (“NEBS” units) for vertical siding panels ad seven (7) units of color difference (“NBS” units) roof panels for a period of ten (10) years when measured in accordance with the standard procedure specified in ASTM D-224 (latest) paragraph 6.3, on a washed test area. Under the terms of the warranty, the building owner was to have notified Fabral® “in writing” within 30 days after the discovery of the defect. Although the building owner did not provide Fabral® with proper notice, one of their representatives had been to the building, shortly after the initial contact was made (we keep notes in a client’s file on every inquiry of this sort). It is possible the client does not recall this visit, or the resulting communication from Fabral®, as it was determined then, the fade rate of the paint was within the allowable limitations. Morals of the story: when offered a solution by a supplier, either accept it, or offer a counter offer – don’t just stew on it or rehash it; as often as possible send and receive important communications in writing; and when ordering painted steel in which fade rate is critical – invest in the best available paint system, Kynar. This entry was posted in Insulation, Steel Roofing & Siding and tagged insulation, Kynar paint, deteriorating insulation, steel paint chalking, steel paint fade, reflective radiant barrier on August 8, 2014 by admin. Eric’s storage building has 5040 square feet of enclosed area. This made for a big roof. A big insulated roof which had a reflective radiant barrier applied between the roof purlins and the steel roofing. Whatever type of insulation is chosen for this type of installation, if it is windy – it isn’t going to be fun. So why even worry about roof insulation or vapor barriers? Single skin metal roofs (typically found in pole building construction) are prone to condensation due to changing outdoor or indoor conditions. Condensation, sweating and dripping can have severe adverse effects on the condition of the building and its valuable contents. 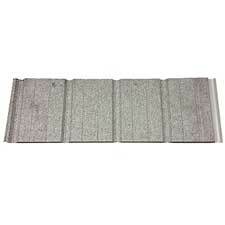 CondenStop fleece is factory applied to the underside or inside of steel roofing and siding panels. It effectively reduces or eliminates the problems caused by condensation. The Condenstop fleece absorbs, stores and releases significant quantities of moisture when condensation would normally occur. When the temperature of a steel roof drops below the dew point, the CondenStop fleece will absorb and store the condensing water vapor. The absorbed water will evaporate again into the ambient air under appropriate temperature and ventilation conditions. Condenstop has been commercially available for 15 years and is the industry leader. It is made from durable polyester materials designed to last the lifetime of the steel panels. A wide variety of testing and in-place projects confirm the product’s durability. Once factory applied, the adhesion is quite strong and comes with a 20-year delamination warranty. The product’s R-value is minimal, only 0.3691, however the product’s value is from its ability to store and release moisture where other materials cannot. Moisture held in the CondenStop will not harm the steel. Full length panels should be used from eave to ridge to eliminate panel end laps and panel areas which are not enclosed. The bottom edge of the steel overhanging a fascia board, or areas in unenclosed overhangs – should be painted, or the Condenstop burned off to prevent microfibers from absorbing moisture from the outside. The use of Condenstop does not take away the need for proper ventilation practices, either in performance, or under the Building Code. CondenStop is Class I flame retardant per ASTM E84-04. It will hold 21 pounds of moisture per 100 square feet (equal to over 10 quarts of water). The microfibers do not support mold growth. It also reduces noise from outside such as rain as well as absorbing sound from inside the building. On Eric’s building, we easily lost an entire day for the crew due to having to fight the winds installing a reflective radiant barrier. 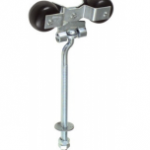 In wind prone areas – CondenStop is an option I would recommend, for the savings in labor costs and time alone. Next time – CondenStop for our building! This entry was posted in Insulation, Steel Roofing & Siding and tagged insulation, vapor barrier, building insulation, insulated steel on July 8, 2014 by admin. Dear Pole Barn Guru: Ventilation for an Old Pole Barn? DEAR CB: You asked for advice, so here it is….your old building has some challenges when it comes to attempting to heat. The ventilation issue is just one of many. The building has no insulated vapor barrier under the roof steel to prevent condensation, which you have touched upon. Two other factors, either of which could be deal breakers – the building has horizontal sliding doors, which are impossible to properly insulate and seal, without them becoming permanently affixed, and the roof trusses are probably not designed to support the weight of a ceiling. With all of this said, you have two really good solutions – the least expensive is to just put up another new pole building, designed properly to be climate controlled, using your existing building for cold storage. The other – knock this building to the ground and rebuild at the same location. Assuming you may not be interested in either of these, and want to pour lots of money into a building you refer to as “crude built”; I will give you some solutions. Toughest first – the trusses. As they are prefabricated wood roof trusses, there should be a manufacturers stamp on every truss. The design loadings might be stamped on the trusses (due to the age of your building the “might” is the operative word). With this information and the location of your building, I could probably give you an idea as to adequacy. If the truss manufacturer’s name can be found – see if they are still in business. If so, they can determine adequacy for you (for a small fee) and get an engineered repair if they are not adequate. If those fail, hire a registered engineer to do an evaluation for you. Condensation under the roof steel…as the steel is nailed on, it cannot be removed and an insulated vapor barrier (something like A1V reflective insulation available from www.buyreflectiveinsulation.com) added. The best solution is probably going to be to spray foam insulate the underside of the roof steel. 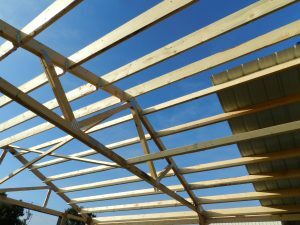 Adding a ceiling – with the trusses verified for the ability to take the load (and correctively upgraded if needed), 2×4 ceiling joists can be placed between the bottom chords every two feet, with LU24 or similar joist hangers at each end. Screw on 5/8” Type X gypsum board to the underside of the ceiling joists and trusses (it won’t span four feet, so don’t even attempt to). Leave an attic access hole somewhere close to the center, so insulators can blow in the desired thickness of insulation. Do NOT place a vapor barrier between the ceiling drywall and the framing above. 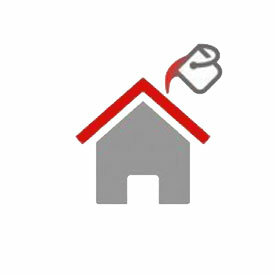 Ventilation – the new codes do not allow for gable vents to be mixed with eave and ridge vents. It is…use one or the other. 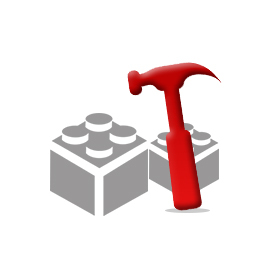 Take the square footage of the footprint of your building, and divide by 300. This gives the net square inches of ventilating area which must be provided in each gable end of the attic. Hansen Pole Buildings has vinyl gable vents, in a myriad of colors, with snap rings. A hole is cut in the steel (using the snap ring as a template), the vent is pushed through from the inside, and the snap ring is then pushed on from the outside (this is a two person job). These vents are designed to accommodate ribs on steel panels. Now the roof is taken care of, the walls are the next challenge. Remove the sliding doors and frame the openings down in size to fit insulated steel sectional overhead doors. You may be able to salvage the steel off the sliding doors, and if done carefully, use the pieces to fill in the gaps. Again, the nailed on wall steel becomes a limiting factor….spray foam for the walls is probably the best solution. Keep in mind, you will need to put either drywall or a steel liner panel on the inside of the columns, as Code does not allow spray foam to be left exposed to heated areas. Good luck – and let me know what choice you make and how it turns out. DEAR POLE BARN GURU: We just made a phone call to Menard’s to order over a hundred bags of blown-in cellulose. While talking to the guy in the building department, he asked if this is for a pole barn, Told him yep. He then strongly emphasized to NOT use blown-in cellulose above the metal ceiling because the flame retardant material will rust and eat up the ceiling. This is the first I have heard of, so I did some quick research online and it looks like they have some kind of acid that act as a flame retardant. Right now, our 30×48 gambrel pole barn with loft are being built. The shop will be finished with R-19 fiberglass in the walls and then T1-11 panelings will be installed. The ceiling is going to be a metal liner, obviously. The loft will be used for storage and man cave, so half of the loft would be finished in the future. There will be Low-E condensation barrier below the roofing, so the contractor told us there is no need for a vapor barrier in the shop ceiling where I would be blowing the cellulose. DEAR PERPLEXED: If the fiberglass and cellulose insulation people would spend more time promoting what each of them do as good, and less time shooting broadsides at each other, life would be so much better and they would probably each sell more product. There have always been concerns about insulation causing corrosion when in direct contact with metal building components such as sweaty pipes, electrical wires or metal boxes, etc. Consequently, ASTM (American Society for Testing and Materials) standards for every insulation material contain testing which specifically addresses these concerns. In addition, in 1979, the CPSC (Consumer Product Safety Commission) promulgated a law, which regulated the fire and corrosive characteristics of cellulose insulation. A statement of compliance with these requirements is required on every bag of cellulose insulation. The types of metal tested with all insulation materials are copper, aluminum, steel, and additionally in Canada, galvanized steel. The test requires placing soaking-wet cellulose insulation with an imbedded .003-inch thick metal coupon inside a humidity chamber under conditions that are ideal for promoting corrosion. After 14 days, the metal coupons are removed, cleaned, and examined under a light to detect the smallest pinhole. In all, there are two coupons of each metal and all must be free of even one pinhole. This is a very strict test! My recommendations are to make sure your attic area is adequately vented (no less than 1/300th of the attic footprint area in venting, provided at least ½ of the vent area is in the top ½ of the attic), make sure the insulation stays dry (no roof leaks), and do not have a vapor barrier between the ceiling and the insulation. Whether you choose fiberglass or cellulose, either should be fine. This entry was posted in Insulation, Pole Barn Questions, Ventilation and tagged insulation, gable vents, remodeling old barn on September 2, 2013 by admin. The National Frame Building Association (NFBA) commissioned a report, which was produced in May 2010, to illustrate point of heat transfer in different types of buildings using thermographic images. Both builders and registered design professionals (architects and engineers) familiar with post frame buildings know these buildings use fewer structural components to create an exceptionally economical, energy efficient and environmentally friendly building. With fewer required structural members, wide spaces are created between wall columns, with fewer breaks in insulation. As well, wood has natural insulating properties compared to steel or masonry structural components. Post frame has been believed to reduce some of the heat transfer observed in other construction methods, due to wider insulation cavities and less thermal bridging. To confirm these concepts, thermal images which provided visual examples of heat transfer were captured. These images highlight inefficiencies which may be caused by the thermal bridging effects of nonwood structural components, compressed insulation and interruptions in contiguous insulation. The authors felt some of the examples could be improved with additional measures, which would further distinguish their construction costs compared to those for post frame. The report covered a very small sampling of commercial buildings – post frame, wood stud framed, masonry and steel framed. Surface temperature variations which appear using thermography of building envelopes can be due to variations in the thermal conductivity (or thermal resistance) of materials, and/or air movement (and hence heat transfer by convection). Other sources of variation include reflective and wet surfaces. Air movement through a thermal envelope is known as air infiltration when air moves from outside to inside, or air exfiltration when air moves from inside to outside. 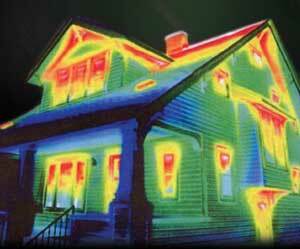 Thermal imagining does not quantify heat transfer; it just indicates regions of elevated heat gain or loss. The post frame building investigated using thermography had R-19 fiberglass wall insulation, R-38 cellulose ceiling insulation and R-8.1 polystyrene perimeter foundation insulation. Air infiltration points appeared to occur at electrical and plumbing penetrations, which can be resolved with minor measures taken prior to construction completion. The all steel building had R-19 fiberglass insulation in the roof and walls and no foundation insulation. The building was found to have major air leakage points, enough so it was impossible to depressurize it to determine air infiltration points. Thermography of the all steel building showed surface temperature drop as the thickness of roof insulation decreased near each roof purlin, with the lowest temperatures occurring where the insulation is compressed by the eave strut. A similar temperature profile was observed at each wall column. Lower surface temperatures were also located near the base plates, due to lack of foundation perimeter insulation. The masonry building measured had untreated concrete block walls, other than an office portion furred in with 2×2 lumber and insulated with R-5.8 fiberglass batts. Ceilings had R-19 fiberglass batts, with no perimeter foundation insulation. The studwall building was a restaurant with 4,125 square feet of conditioned space. Insulation was R-11 fiberglass wall batts and R-38 cellulose in ceilings. The foundation perimeter was non-insulated. This building was relatively “leaky” from an air infiltration standpoint, with measureable air infiltration at the bottom and top wall plates, as well as at penetrations. Lower surface temperatures were seen at the wall studs, where the heat loss through framing (depending upon size and spacing of the studs) can vary from 33 to 49 percent of the total. This study underscored the importance of sealing cracks or spaces between framing materials in a buildings thermal envelope and showed both the measurable difference a small amount of insulation can make and the impact of compressing fiberglass insulation. Finally, this study showed a uniformly insulated thermal envelope is readily achievable with post-frame construction. There are fewer breaks in insulation where bridging may occur compared to stud-framed structures. Wood structural components do not conduct heat as readily as steel or masonry structural components. Wood posts and heavy trusses used for post-frame require fewer structural materials to be installed, so fewer materials are required. The primary building materials are renewable wood structural components and recyclable steel or other types of cladding. Thermography helps illustrate where thermal bridging may occur. Given these factors and the comparatively low cost of post-frame buildings, post-frame construction may be among the most cost-effective ways to build for sustainability and energy efficiency. This entry was posted in Insulation, Pole Building Comparisons and tagged insulation, fiberglass insulation, batt insulation, thermal bridging on August 29, 2013 by admin. One of the beauties of post frame (pole barn) construction, is they are very forgiving during construction. A virtual plethora of errors can be made, and overcome, leaving a fine looking and well-functioning building. There is one error, which is one of advance planning rather than installation skill, which is not so easy to rectify. The great majority of pole buildings are constructed with steel roofing and siding. Light weight, strong and durable – steel remains the covering of choice in creating a maintenance free structure. With the idea of “having the lowest price”, far too many providers (both builders and package providers) neglect to discuss with their clients how important it is to have an insulated vapor barrier between the roof purlins (framing) and the steel roofing. Without a properly installed thermal break, condensation issues will arise. Once the drips start forming on the underside of the roof steel (trust me – it WILL happen), the beautiful brand new building, becomes not quite so functional. Now there are some after the fact solutions for adding a vapor barrier. Adding a significant R value per inch (albeit an expensive fix) is the use of professionally applied spray foam insulation. Priced this solution? If so, you better have been sitting down when the quote arrived. Another, less expensive method, is to apply reflective insulation as a vapor barrier to the underside of the roof framing. This application works well in both all steel as well as post frame buildings. 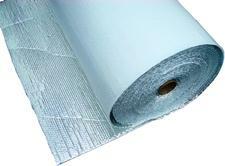 Reflective insulation can be applied from eave to eave beneath the framing, using double sided tape. In order to have the insulation be effective, it is imperative all edges be tightly sealed with appropriate tape. If the reflective insulation was not purchased with an adhesive pull strip tab on one edge of the rolls, the seams between each roll will also need to be taped. While this is a fairly inexpensive solution, from a materials standpoint, it will require a fair amount of time, working above one’s head, and often at a considerable height. Best solution of all – don’t end up being penny wise and pound foolish in trying to save a few dollars by leaving the insulation out initially. The drip-drip-drip of condensation will most certainly leave a bitter taste. This entry was posted in Roofing Materials, Steel Roofing & Siding and tagged insulation, pole building insulation, pole barn condensation on December 4, 2012 by admin. Insulation is one of the topics, once brought into conversation, seems to make most folks’ eyes glaze over. Many know enough to ask about R Value, and understand “the higher the better”. Or so they think. Sometimes you need to stop a minute and go back to the source of what I call “the need”. This is the way I teach our Building Designers, and clients as well, to think about any feature or addition to their pole building kit when they design their new building. 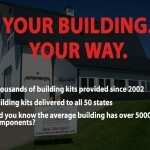 What are you going to need for your building? Don’t just throw a bunch of stuff in and on there because it “my neighbor put it on his building”. What are your needs? 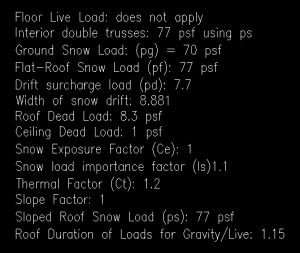 Obviously we all choose features we want on our building, “just because”. Just because it looks nice, gives the building a classier look, a lower profile, or we think the eagle on the weathervane hovering over the cupola is “pretty cool”. This is all well and good, but insulation is not one of those “pretty parts” of a building. Necessary yes, but what type and where do you put it? When I designed my most recent pole building for my own use, I researched several types of insulation, and ended up using not one or two, but three different types of insulation, and each of them for their own specific purpose in relation to cost. In other words, “what is the cost value” for each of them? The types of insulation I looked at ranged from what most folks think of when you say “insulation”: fiberglass insulation, to foam board, spray on foam and B.I.B.’s (Blow in Blanket) along with the reflective type vapor barrier insulation in various configurations and applications. I ended up putting reflective radiant barrier under my roof steel, wrapped my entire outside of the building in a reflective radiant barrier, put reflective radiant barrier under the heated concrete floor, fiberglass insulation in the interior walls, and then B.I.B.’s in the exterior walls. Wow, I hear clients saying, “How do you know what to put where?” Easy – once again it goes back to the “need”. Over the next couple of days I will cover a few of the insulation choices out there, so get out a sheet of paper, make yourself a grid, and next time you need insulation, ask yourself these easy questions to decide “which insulation you are going to put where” in your new pole building. First question, what is R value? For those of you who are not familiar with R values, it is simply the measure of resistance to heat flow. R-1 is equal to the resistance of a 1” thickness of wood. Insulation materials have tiny pockets of trapped air. These pockets resist the transfer of heat through material. The ability of insulation to slow the transfer of heat is measured in R-values. The higher the R-value, the better insulation’s ability to resist the flow of heat through it. Before you consider these products, read the test reports carefully. In order to achieve the full promised values, the products must be installed in the center of an appropriate dead air space. Second question, what are you going to be using your building for? This will help you to determine what type of insulation you are going to need. Of course, your “need” for insulation also depends on where you live. If you are in Minnesota where I have my newest building, and want to change the oil in your car in January, putting reflective radiant barrier in the roof and even on the walls is probably not going to keep me warm. No heating system is going to keep up with the heat pumping out of my building! And, if you live in Knoxville, Tennessee and are OK working in your shop with coveralls on a few hours a week, your insulation answer will be greatly different than if you want to sit in your new shop in your shirtsleeves with your buddies watching the Super Bowl come January! So your first project is this: take a sheet of paper and write down all the things you want to “do” within the confines your new building, including keeping pets, horses, or other animals at the right temperature. Also make a list of other reasons we put insulation in spaces – noise for one. Do you need good sound abatement for the “practice garage” for your son’s rock and roll band? Is the loft bedroom right above where you work on motors or have a workshop with noisy machinery? Once you decide on what your needs are for insulation, you can just match it to the Insulation Grid we’ll be making over the next several days. I’ll be back tomorrow to start with the simplest of all insulation: reflective radiant barrier which includes a vapor barrier. Winter is coming, so stay warm! This entry was posted in Pole Barn Planning and tagged insulation, vapor barrier, fiberglass insulation, reflective radiant barrier on November 15, 2011 by admin. Lying or Just Plain Stupid? It amazes me the ignorance about pole buildings after over 80 years of solid pole building construction. A bit more about this particular client’s building. It is 40’ x 80’ with a 14’ eave height. The client initially contacted the builder to get a labor quote only – to construct a Hansen Building kit. The client specifically asked for one of our pole buildings. The builder told this client a pole building would be way too complicated to construct and the stick frame building would be less expensive. Let’s look at the realities of the situation. To construct a stick frame building will take excavating a trench around the perimeter of the building to below the frost line (and it DOES freeze deep in Maine). A footing must be formed and poured. With a wall this tall, I’d imagine at the least it would have to be eight inches thick and 16 inches wide with rebar in it. On top of the footing will need to be formed up a foundation wall. This foundation is going to be a minimum of four feet tall, due to the frost depth. The wall should probably be an eight inch wall, but assuming six inch thick, three truckloads of concrete will be used for the footings and foundation! With the pole building, holes are augered in the ground and around five yards of concrete are required for the backfill. Pretty low tech and saves a bunch of money in equipment, materials and labor. 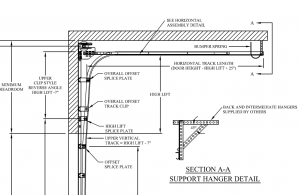 A kicker the contractor may not have considered, or has ignored….the maximum stud wall height allowed (according to code) without engineering is 10’. His building is going to need to be designed by a registered professional engineer in order to meet code requirements. As far as “movement”, steel roofing and siding has shear values nearly equal to those of 7/16” osb or ½” plywood. Imagine the steel as being very thin, very strong plywood. It is the sheathing of a building which holds the frame stable, not the framework. With steel and plywood virtually equal for strength, it takes away the “movement” issue. Our Hansen pole building office is 44 feet high from ground to roof peak and has no noticeable movement in even the extreme wind loads of South Dakota. Moving on, let’s address the issue of “eliminating dust”. Each steel panel overlaps the adjacent panel which prevents dust infiltration. Base trim (aka “rat guard”) keeps dust from entering around the base of the building. All other steel edges have trims which cover possible infiltration areas. The eave edge of the roof steel and under the ridge cap are sealed by form fitting closure strips, which seal those areas. The only place for dust to enter either style of building is going to be via an open door! Same goes for security – your building is only going to be as secure as the quality of the doors. Chances are the builder is going to provide entry doors with wood jambs, which is an invitation to enter via a good swift kick. The commercial steel doors we provide have steel jambs as well. No one is going to break those jambs with a kick. As for a vapor barrier, our buildings come standard with a reflective radiant barrier for under the roof steel. With our exclusive PSA (pull strip attached) adhesive strips, proper installation assures the elimination of condensation. A side benefit being the increased insulation value and the reflective radiant barrier is superior against heat gain. Using plywood on a roof proves to be expensive, adds weight to the roof system and requires the use of asphalt felt paper or other similar and materials to create a water tight seal. If ignorance is bliss, this particular contractor is either very happy, or he is feeding a line to the client. If the first, he is doing no justice to the client, if the second, he’s worse yet. My guess is… stick framed is all he knows. He is just too lazy to try something “new”, easier….and cheaper for the customer, while being just as solid, air tight and long lasting. 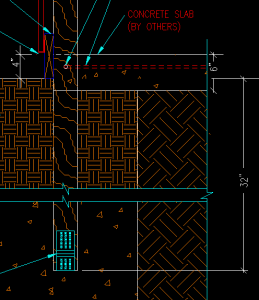 This entry was posted in Building Styles and Designs, Pole Barn Planning, Pole Barn Structure and tagged foundation, insulation, pole building foundation, vapor barrier, reflective radiant barrier on June 28, 2011 by admin.